Breed origin: Shetland ponies originated in the Shetland Isles, located northeast of mainland Scotland. Small horses have been kept on the Shetland Isles since the Bronze Age. People who lived on the islands probably later crossed the native stock with ponies imported by Norse settlers. Shetland ponies also were probably influenced by the Celtic Pony, brought to the islands by settlers between 2000 and 1000 BCE. 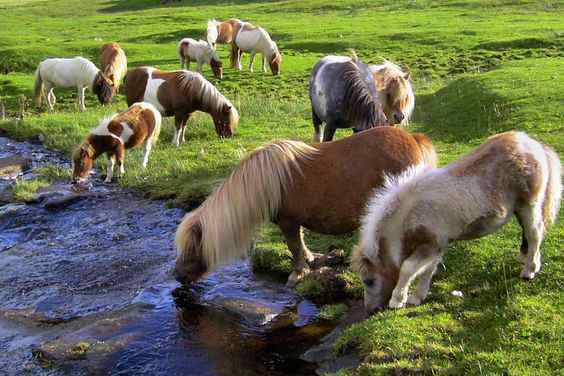 The harsh climate and scarce food developed the ponies into extremely hardy animals. Shetland ponies were first used for pulling carts, carrying peat, coal and other items, and plowing farm land. Then, as the Industrial Revolution increased the need for coal in the mid-19th century, thousands of Shetland ponies traveled to mainland Britain to be pit ponies, working underground hauling coal, often for their entire (often short) lives. Coal mines in the eastern United States also imported some of these animals. The last pony mine in the United States closed in 1971. Distinguishing features: Shetlands range in size from a minimum height of approximately 7 hands to an official maximum height of 11 hands. Shetland ponies have heavy coats, short legs and are considered quite intelligent. They are a very strong breed of pony, used for riding, driving, and pack purposes. Shetland Ponies are hardy and strong, in part because the breed developed in the harsh conditions of the Shetland Isles. In appearance, Shetlands have small heads, sometimes with dished faces, widely spaced eyes and small and alert ears. The original breed has a short, muscular neck; a compact, stocky body; short, strong legs; and a shorter-than-normal cannon bone in relation to its size. A short broad back and deep girth are universal characteristics, as is a springy stride. Shetlands have long thick manes and tails and dense double winter coats to withstand harsh weather. Shetland ponies are generally gentle, good-tempered, and very intelligent by nature. They make good children’s ponies, and are sometimes noted for having a “brave” character. They can be very opinionated or “cheeky”, and can be impatient, snappy, and sometimes become uncooperative. Due in part to their intelligence and size, they are easily spoiled and can be very headstrong if not well-trained. Modern day Shetland pony: Today, Shetlands are ridden by children and are shown by both children and adults at horse shows in harness driving classes as well as for pleasure driving outside of the show ring. Shetlands are ridden by small children at horse shows, in riding schools and for pleasure. They are seen working in commercial settings such as fairs or carnivals to provide short rides for visitors. They are also seen at petting zoos and sometimes are used for therapeutic horseback riding purposes. In the United Kingdom, Shetlands are also featured in the Shetland Pony Grand National, galloping around a racecourse with young jockeys.